Although he joined the Nazi party in the early ’30s, Emil Nolde’s paintings were confiscated from the museums and his work was slandered as Degenerate Art. From 1941 on, he was prohibited from making art at all. Nolde, who was then in his seventies, secretly continued to paint…dangerous paintings, indeed. He turned to watercolor for fear that even the smell of oil paints might give away his covert paintings. He lent many of his works to friends for safekeeping, in order to protect himself and his art from Gestapo raids. Others he hid in the floorboards of his house. Nolde called these small watercolor sketches, the size of postcards, “my unpainted pictures,”… “unpainted” in the sense that they did not officially exist and were not supposed to exist. Seventy years later, these gorgeous, diverse, and quietly moving “unpainted pictures” continue to be nothing short of brilliant. Twenty-six years old and a new recipient of the prestigious Prix de Rome, Graham Nickson arrived in Italy to train at the distinguished British School at Rome. Graham Nickson: “A terrible thing happened when I first got to Rome, and it was probably one of the most important events in my life. The year was 1972 and I arrived in Rome in the middle of a thunderstorm. It was raining so badly that it was impossible to find a hotel. I had arrived way before the time I could take over my studio. I had brought with me a portfolio of about two hundred of my best gouaches and drawings. I left the portfolio in the car, because it was raining so hard. Twenty minutes later, when the rain had subsided slightly I found that somebody had put a brick through the window and stolen the lot. There I was, with all my history gone. After simmering down a couple of days, I went up on the roof of the Academy. I was looking at this dramatic sky, and it occurred to me that the most dangerous thing would be to paint the sunset, and then the sunrise because it’s so clichéd, so hackneyed. Even at its best, it had already been done so well by Turner, Nolde, and other artists. Graham Nickson is the Dean of the New York Studio School of Drawing, Painting and Sculpture, New York City. The Metropolitan Museum of Art holds eleven of Nickson’s works in their permanent collection. Nickson continues to paint evening and morning skies on a regular basis. Graham Nickson has an exhibition through May 22, 2015, at the Betty Cuningham Gallery, New York City, www.bettycuninghamgallery.com. More of Emil Nolde! Click here if you are unable to view the video. WOW!! I always thought of watercolors as pallid, basically insipid things. That was before you showed me Nolde’s work. Beautiful, powerful, brilliant. Thank you. His work looks amazingly like your very own! Thanks so much for the lesson on Nolde. 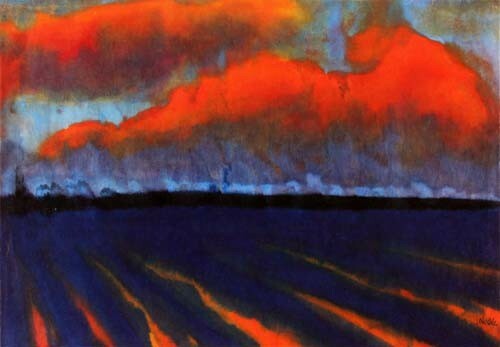 I studied German expressionism, but don’t remember much abt Nolde. That video was a delight to the eyes!! Thank you so much sharing this fabulous video! I have always loved Nolde! Thank you. Each of Emil Nolde’s paintings were simply, beautiful. The whole collection just stunning. Thank you for bringing attention to Nolde’s water colors and the contemporary painter Graham Nickson. I saw Nickson’s show at Betty Cunningham gallery. Color is Nickson’s gift to us! I loved the Nolde and hadn’t heard of him. Have you come across the “Entartete Musik” from the same period? Jewish (usually) composers banned by the Nazis. Kurt Weill, of course, Korngold, who composed lots of Hollywood music, but also composers like Zemlinsky. Decca launched a series of CDs featuring it which then mysteriously became unobtainable in the UK but Bob bought some of them in Germany. Kirby, a wonderful, creative juxtaposition of two artists with radically different backgrounds, each producing similarly powerful subject matter themes. Leave it to you to find them and think to put them together. What wonderful colors! Thanks for sharing. It’s a moving tribute to painting as well as nature. Thank you for this piece. I’ve always loved Nolde and now, thanks to you, Nickson too. This installment proves that there are no hackneyed subjects, only hack painters. Sunrises and sunsets are some of my favorite things so it was pure pleasure to see so many of them in the paintings of Nickson and Nolde. Nickson’s story of loss and then being willing to paint what he considered a dangerous thing is inspirational. His Sarageto VII is full of color and brooding. It makes me want to see more of his work. While I appreciate Nolde’s work, I can say that Graham’s use of water color continues to influence how I use watercolors. Forget the washed out, delicate, lov-er-ly, insipid water color paintings that I continue to see in galleries and homes. Graham just lets you have it with his vibrancy of color and his simplicity of shapes. One is drawn to his paintings. One must really look at his paintings. No ho-hum “wall crawl” ! Thanks for the comparison, Kirby, and for featuring Graham. Thank you Kirby for educating me on Nolde’s beautiful watercolors! Such an interesting pairing of artists. He and Graham see the world in strong inventive color relationships, always with a unique view. I saw Graham”s show at Betty Cunningham and his watercolors are truly a force of a personal vision. How lucky we all have been to study with him! From my first exposure to Graham’s art in 1979 to now, his work always continues to excite and inspire. I am not familiar with the work of either artist but their art is exciting, provocative and captures ones attention promptly. The colors are bold, somewhat detached. When taken as a whole the result finds yourself returning, and then returning again to enjoy the visual image. Great video. Graham Nickson’s show at Betty Cuningham is a long awaited treat. For those familiar with Nickson’s larger works, this show offers smaller, more intimate paintings. 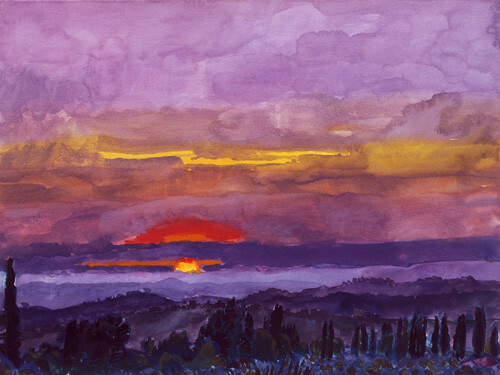 The watercolors and oils exhibited show a dedication to looking long and hard at the sunrises and sunsets that are among the artist’s favorite subjects. The delicate touch and sensitive use of color are a delite. So nice to see some painting in NYC!